Taylor Griner, junior graphic design student from California Baptist University, visually redesigned the Boeing 727-200F airplan CBU received in January. Griner’s final design was painted onto the aircraft this summer. The plane was donated by Federal Express, kick-starting the Department of Aviation Science. Griner said she contemplated what would appropriately display CBU’s mission statement and after playing around with some ideas, decided on her final design that won the competition. Griner had to work her design around certain guidelines set for the project. The 727 had to have the CBU logo somewhere on the aircraft, and the tail was required to be painted. CBU wanted to keep the body of the plane white, but the university’s name had to be displayed. The Boeing 727 now displays CBU’s colors, highlighting the university’s theme, “Live your purpose.” The tail of the plane boasts the CBU Lancer logo, and the jet engines have “Live Your Purpose” transcribed across their blue surface. The projection of Griner’s inspiration, the globe, was made into a decal and positioned on both sides of the aircraft. Micheal Berger, director of design and photography at the College of Arts, Visual Arts and Design, has had Griner in class and is proud of her hard work. The aircraft will supply a hands-on environment for the inaugural class. Although the plane’s data plates have been removed to prevent it from being flown, the aircraft has full ground power. 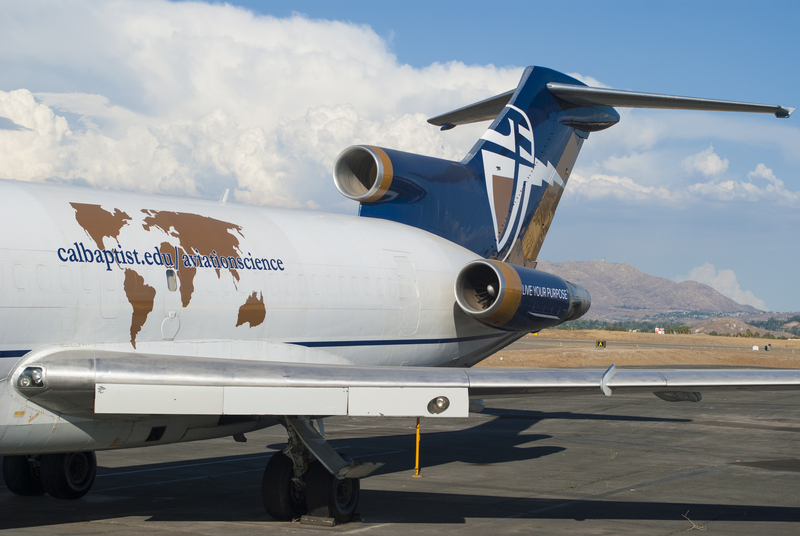 The Boeing 727 is stationed at the Riverside Municipal Airport and provides students with experience working on a real airplane.